Heavenly blog! : No. 941: I go happily in prison for having preached God's word against divorce and remarriage among preachers and overseers / women! No. 941: I go happily in prison for having preached God's word against divorce and remarriage among preachers and overseers / women! I go happily in prison for having preached God's word against divorce and remarriage among preachers and overseers / women! It is strange with this so-called battle between me and the false apostle Jan Aage Torp. It looks more and more like a farce when purely verbal so Torp gone much longer than me on the verbal area both against me and many others. Then one would think that everything was offset, but not this time! But he has deleted it from the net, but he has enough stored data. For he uses everything against you that have been written for umpteen years ago. I have very good experience with. But a possible lawsuit so, the police's job to bring it out, if they are professional and doing their job. But it is doubtful that they make themselves worthwhile when it gets too revealing. However, it is strange, if Torp says something then laughing all of it. Whereas when I say something, then screams everyone (although we say the same). Why? Torp seeking attention through what he preaches and writes, but his words fall dead to the ground. Why is this so? I preach the truth when I stand in truth. Torp is a cheat, crook and a false apostle, he stands in lies and untruth, which put every thing then! 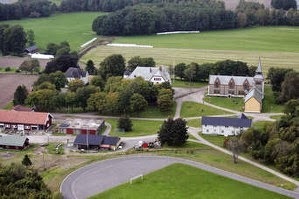 Photo Bastøy. Looking forward almost to come here even though this obviously is a miscarriage of justice when all I have written, said and spoken come under religion and freedom of expression. And that artillery from Torp and his allies far exceeds what I've come up with. 3 weeks on Devil's Island and so I can get it on their CVs that I have been in prison. It's really a small target to experience something like that. Of course, I have neither spoken or written and far less committed a crime. But putt, putt, a little stay in prison, I can see that reaching if it becomes relevant. But that will not be before 2016? The three weeks I really enjoy myself, for some better place one in a Norwegian jail, a well while looking for? It was like a prison director from USA said when he came to Norway that even at a hotel in the US has not improved. Shall I believe his word, and this is very good! And where can I tell others about Jesus and the Gospel. Here from Bastøy, it looks incredibly idyllic, super and lovely. Looking forward already to such imprisonment if it gets something out of. How does North Korea and other dictatorships? As Manglerud Police proposes. Is not inside in the heat, so one should be, whether there has been any crime. And others have done things that are far worse, it will be ignored. Anyone who is not inside the heat, bring the person or persons at any cost. We have virtually been persecuted and I do not know what? Also created a fake blog in my name. But what are obviously criminal and far without passing normal, it's suddenly just fine! Jesus, Paul, John, Peter and all the other men of God and women experienced the same thing as me. So I'm going company. Although they never did anything criminal or punishable, they come on the edge of the law and authority. Acts 4. 13 When they saw the boldness of Peter and John, and understood that they were uneducated men of the people, they marveled. They knew they had been with Jesus, 14 and seeing the man who was healed standing there with them, they could not say the contrary. 15 They sent them out of the council chamber and met to consult together. 16 They said: "What shall we do with these people? They have done an openly under; it is clear to all who live in Jerusalem, and we can not deny it. 17 But this must not be allowed to spread more among people. Therefore, we threaten them so they do not speak to any man more in this name. "18 They called them in again and commanded them to keep up with preaching and teaching in Jesus' name. 19 But Peter and John answered them, "Whether it is right in God's sight to obey you more than him. 20 But we can not but speak the things we have seen and heard. "21 Then they threatened them even more, but let them go. For they found no way to punish them as long as all the people praised God for what had happened. 22 The man who was healed by this miracle, was the over forty years. 23 After they were released, they went to their own and told them what the chief priests and elders had said. 12. 3 When Herod realized that Jews enjoyed this, he went ahead and got caught Peter also. It was the Feast of Unleavened Bread. 4 After he was taken, he was thrown into prison, where four guard shifts, each of the four men, was set to keep watch over him. Then Herod would bring him before the people after Passover. 5 Peter was then sitting in prison, and meanwhile asked the congregation fervently to God for him. 6 The night before Herod was going to bring him out, Peter was sleeping between two soldiers. He was bound with two chains, and the prison was guarded by sentries who stood outside the door. After the paperwork I have received from the police so they will want me to in court if it becomes case pay 12,000, - kr and sit in jail for 24 days if I do not accept the fine or penalty. Now I'm never going to accept any writ or otherwise. And if it goes in from the District Court, High Court and Supreme Court. Through three courts and I both hope and believe I will win. But should it go against loss, then I meet a great desire after all. Prison for his name's sake, something more blessed than it can hardly achieve? The first Christian saw it as an honor to experience something like that. Acts 5. 41 They left the Council, rejoicing that they were found worthy to suffer shame for his name's sake. I need a new car, just an old car from 1998 is seventeen years. Have a desire to buy a new car, when I need it. But then I just postpone the purchase, and use that money on legal fees etc. and imprisonment for 24 days being well three weeks? There goes your vacation next year, but the putt putt. This I can do it, it is then no life to do to get in a Norwegian prison? Although I am Norges least criminal man, has been law-abiding and only lived a wonderful life really throughout his life. Before I was saved, I was active sportsman, and afterwards that saved I have worked and been on, so this is probably not that difficult! And some help with paying attorney fees and costs as there are only doing it! It will be welcome and encouragement.